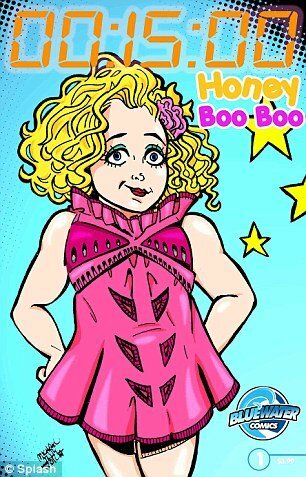 Reality star Honey Boo Boo has been immortalized in cartoon form, in a garish new comic book titled 15 Minutes. The colorful 23-page magazine charts seven-year-old Honey Boo Boo over the past 11 months, from her TV debut in Toddlers and Tiara’s to landing her very own reality show. Kris Jenner, Rosie O’Donnell and Anderson Cooper also have cameo roles in the short book. In one of his strips Michael Troy asks readers “What is fame?”, responding with a quote from poet Lord Byron that “it is the thirst of youth”. U.S. publishers Bluewater Productions, say the magazine examines the “the underbelly of fame”. Its publisher Darren G. Davis explained that people shouldn’t take the magazine too seriously. He said: “Clearly this one was meant to be fun for people and not to educate society. Bluewater’s comics have previously featured stars such as One Direction, Katy Perry, Justin Bieber and Demi Lovato. Its new series 15 Minutes will focus on personalities from the realms of reality TV, and it hints that Kim Kardashian, and characters from The Real Housewives of Beverly Hills and Jersey Shore could possibly star in future issues. It isn’t the first time Honey Boo Boo has been imagined in cartoon form.